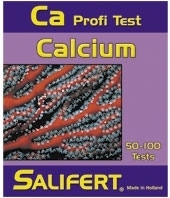 Saliferts calcium test is capable in resolving the calcium content in 10 mg/L steps. The color change is sharp and facilitates the detection of small but highly significant fluctuations in the calcium concentration. Salifert is the only one in offering a true accuracy and precision as claimed. Salifert's Coral Calcium additive is manufactured using a very special procedure. This results in a highly concentrated additive that not only makes calcium addition easy, it also avoids that the ionic balance is disturbed when used in combination with our KH + pH Buffer or any other sodium based buffer. Common additives, which contain only calcium chloride or improperly use of kalkwasser (calcium hydroxide), can upset the ionic balance resulting in aquarium water very different from NSW.